Only one of its kinds, our permanent relaxer contains only the best herbs, free of chemicals and guaranteed to aid in hair growth. 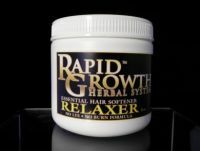 Rapid Growth herbal relaxer is a no lye, and non-sodium-based relaxer, which is replaced with alkaline; to prevent hair ends from melting. Say, goodbye to split ends which result in clipping them and hair breakage due to such harsh chemicals. Rapid Growth enables hair to grow thicker and longer. Rapid Growth is excellent for persons with sensitive scalps.